Enlisted 11 May 1908 for 5 years as SS107108, serving on seven ships. Re-enlisted 18 May 1913 for 12 years as K19637, but served only on HMS Cressy. Drowned in the North Sea on 22 September 1914 when HMS Cressy was sunk by a German submarine. Remembered on Chatham War Memorial. In the early weeks of the war, three elderly armoured cruisers – HMS Aboukir, HMS Hogue, HMS Cressy – were assigned to patrol an area off the Dutch coast known as the ‘Broad Fourteens’. Because they were old, slow and generally under-gunned, these vessels were jocularity described as the ‘Live Bait Squadron’, and some in the Admiralty expressed doubts over the wisdom of assigning such ships to this duty. These fears were proved valid on 22 September 1914 when the three ‘Live Bait’ ships were sunk by torpedoes fired by the German U-boat U-9. A total of 1,459 British sailors, many of them cadets or reservists, died in this action. Born 9 May 1890. 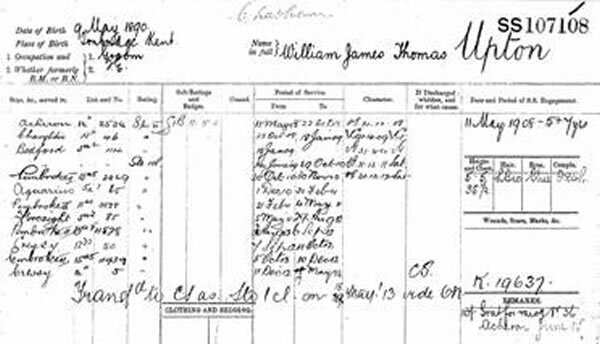 Baptised 8 June 1890, parents William and Francis. 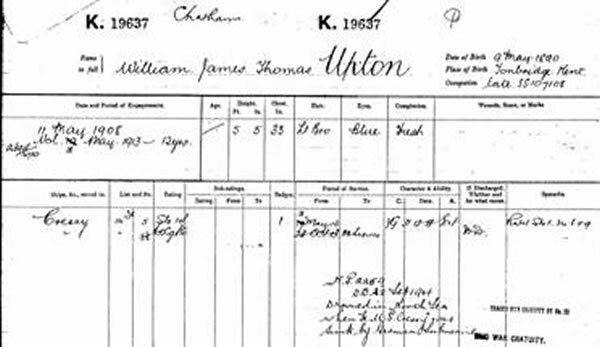 In 1901 census is shown as aged 10 and living with widowed father and 13 year old sister in Bidborough.